Regional Australia cannot be thought of as one homogenous area. Nor can regional Australia necessarily be thought of, or referred to, as a remote area. Characterising or stereotyping areas as such leads to incorrect analysis and poor policy outcomes. For instance many regional towns and cities are in very close proximity to the major state capital cities. 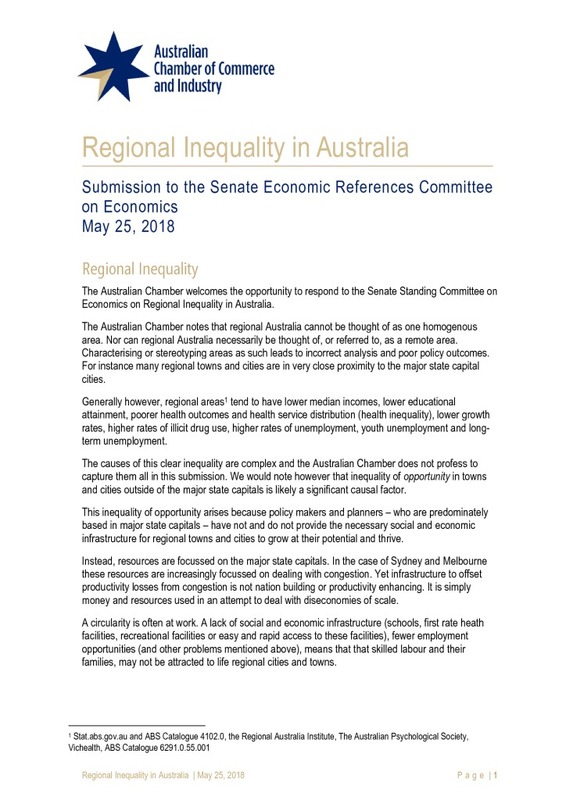 The causes of regional inequality are complex and the Australian Chamber does not profess to capture them all in this submission. We would note however that inequality of opportunity in towns and cities outside of the major state capitals is likely a significant causal factor. This inequality of opportunity arises because policy makers and planners – who are predominately based in major state capitals – have not and do not provide the necessary social and economic infrastructure for regional towns and cities to grow at their potential and thrive.